At one time or another, most of us have experienced the feeling of looking around our home and no longer being satisfied or inspired by its interior. Maybe you tried a few trends that don’t look quite as fresh as they once did or perhaps the wall color you once loved now feels drab or outdated. Regardless of your reasons, it’s nearly inevitable that at some point you’ll feel ready to refresh your home with new and inspiring updates. However, sometimes our budgets aren’t quite as big as our motivations for change. Fortunately, there are quite a few interior updates you can apply that will make a big difference while costing very little time or money on your part. If you’re ready to fall in love with your home all over again, be sure to add the following interior updates to your to-do list. It really is amazing what a difference new faucet, appliance, and even door handles hardware can make on your overall aesthetic. And your options for this are both endless and affordable. You can add trendy brass pulls and a matching faucet, like this look from Emily Henderson; you can add patterned ceramic knobs in lieu of standard pulls; or, you can mix and match your metals to add layers of visual intrigue. Like we said, the possibilities are endless. A statement wall is a killer way to make a major change without spending much time or effort to do it. And they have a special knack for making your design look more rich and dynamic. Consider a playful pattern, like this one from Mr. Kate. Or, you can simply paint one wall your favorite color. If you’re worried about making a commitment you might regret, then consider that there are a ton of beautiful removable wallpaper options out there that you can take advantage of without committing too much. If your room is a photo, your window treatments are the frame, so switching these up is a super simple move that can completely transform the look of your space. Plus, there are truly endless options. You can opt for sheer flowy curtains, a set of roman blinds, or you can combine the two like this gorgeous window treatment setup from Studio McGee. Throw pillows are basically makeup for your living room—you can switch and swap them depending on your mood and the season, and the effect is nothing short of transformative. If your space is feeling a little dull, consider adding a few pillows in vibrant colors to bring more uplifting vibes. And if you’re moving toward a boho aesthetic, then adding pillows featuring organic hues and textures, like these from Kaekoo Shop, is a great way to go. Rugs have a special ability to add warmth and definition to the spaces they’re in. So, if you’re looking to redefine your space, there’s no better way to do it than with a new area rug. Of course the colors and patterns of the rug you choose are important, but the placement of your rug makes an impact as well. In this space from Kirsten Blazek, the rug is laid on a diagonal, which brings additional movement and visual interest to look. A statement wall isn’t the only way your walls can help you revive your space; your walls are brimming with refreshing possibilities. You can artfully arrange a few floating shelves to showcase some of your favorite knick knacks, add a big piece of statement art, or create a chic and sophisticated gallery wall like this gorgeous arrangement from Design Setter. Your bed is essentially the centerpiece of your bedroom. Therefore, if you’re looking to bring some more life to your bedroom design, then there’s no better way to do it than by updating your bedding. 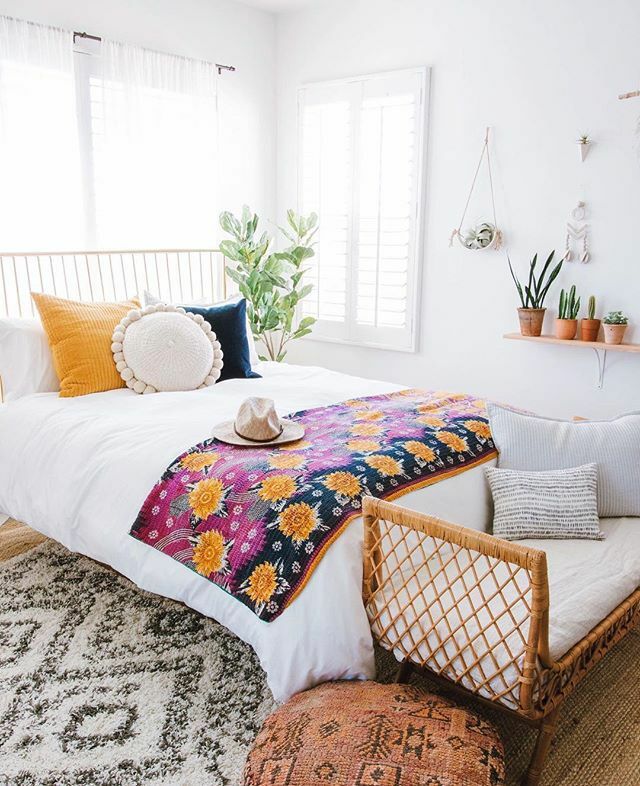 From a cozy hygge-inspired bed featuring layers of big comfy blankets to cheerful pops of color and compelling textures, like this design by Anita Yokota, your options on this front are limited only by your imagination.